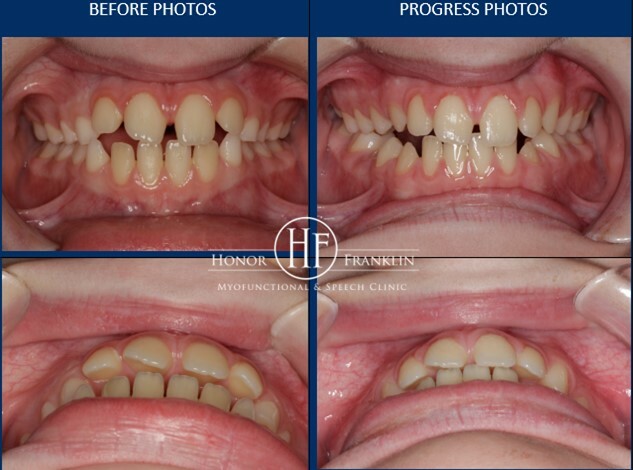 Another example of the results obtained in this 10 year old boy’s dental occlusion after being enrolled in the revolutionary mini-orofacial myofunctional therapy program created by Dr. 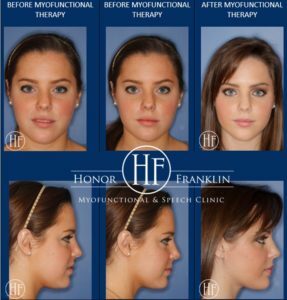 Honor Franklin at Honor Franklin Myofunctional & Speech Clinic concentrating on lip competence and nasal breathing (via the help of an ENT and Allergist on her team) and NO tongue therapy and NO swallowing therapy and No orthodontic treatment yet. It WORKS!! Note: OMT never takes the place of orthodontics. Are these habit appliances working??? Look at this. This patient had a heavy metal “tongue crib” dental appliance designed to block a lateral tongue thrust. DID IT WORK?? ? Did it teach the tongue where it should rest which is against the palate not touching the teeth? Did it address the Cause of the problem which is usually a nasal airway issue? Did it close the dental open bite? ? Does the dentist realize it’s not the tongue thrust SWALLOW that is causing this dental malocclusion but is the incorrect RESTING POSTURE OF THE TONGUE? Why Are Photographs So Important for Orofacial Myofunctional Therapy? I have specialized in Orofacial Myofunctional Therapy since 1977 and I feel one of the reasons I have been so successful for 40 years is because I document my patient’s progress through photographs (and videos). To me, the reason why photographs are so important is not only for proof that Orofacial Myofunctional Therapy (OMT) works (and it does!) – but also because it’s a great motivator for my patients because the progress made in OMT is so gradual. It’s not like getting a haircut while one sits passively in a chair reading a magazine and an hour later, leaves the salon looking different. In OMT, there is a gradual progression of improvement. There is also no magic wand. To be successful in OMT requires a lot of hard work on the part of the patient by not only practicing exercises everyday but they must be compliant in following the Allergist and Ear, Nose and Throat doctors’ recommendations since nasal airway interference is the primary CAUSE of Orofacial Myofunctional Disorders (OMDs). All of my patients are referred to an Allergist and ENT that understand OMDs before I initiate OMT since nasal airway interference is the CAUSE and OMT is treating the EFFECT. I never want to get so caught up in treating the EFFECT that I ignore the CAUSE. I have found Allergies are much more prevalent than structural nasal obstructions like enlarged tonsils and adenoids, etc. which is why a referral to an ENT AND Allergist is so important. Allergies are considered a Chronic Disease because there is no cure. The patient must learn how to control their allergies and the Allergist I refer them to is an expert at teaching my patients how to control their allergies. Once the patient and parent understands the importance of achieving a patent nasal airway consistently and have followed the recommendations of the Allergist and ENT, the patient is enrolled in OMT at my clinic. A sucking elimination therapy program to eliminate any non-nutritive sucking habits. A mini-orofacial myofunctional therapy program for 5 year olds to 10 or 11 year olds that concentrates on lip competence. A formal orofacial myofunctional therapy program for 11-12 year olds to adults. 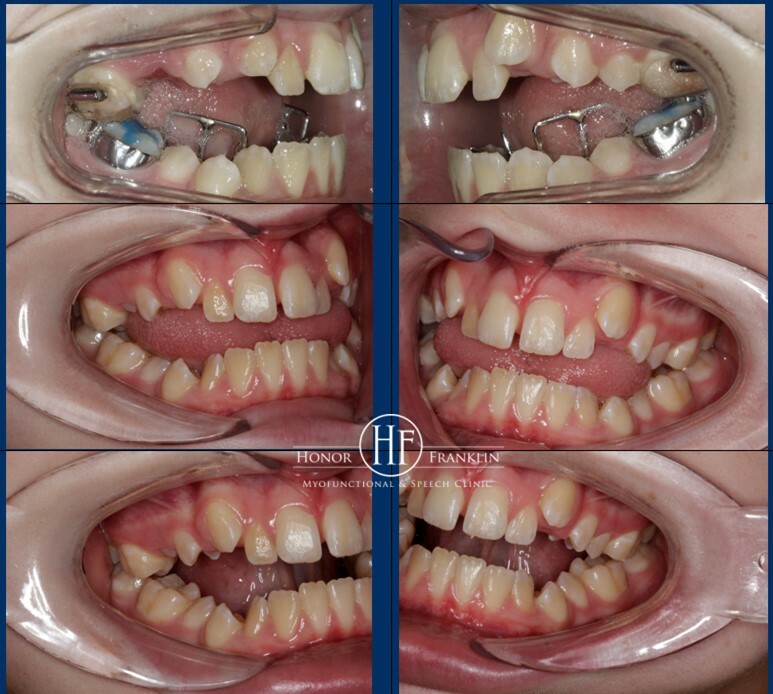 This patient is a 7 year old female who exhibited an incorrect oral rest posture of the tongue and lips consisting of an open mouth, low forward rest posture of the tongue against and between the teeth. As a result of the incorrect oral rest posture of the tongue and lips, she exhibited an incorrect swallowing pattern. A referral to the ENT revealed no structural obstructions but a referral to the Allergist revealed significant allergies characterized by Perennial Allergic Rhinitis with seasonal (spring/fall) exacerbation. Once she was able to breathe nasally consistently by following the Allergist’s recommendations, she was enrolled in the mini-myofunctional therapy program or lip competence therapy/program where she was seen for 16 visits over a 3 1/2 year period. This 19 year old female patient was enrolled in the formal OMT program. She presented with an incorrect oral rest posture of the tongue and lips consisting of a Chronic open mouth, low, forward resting posture of her tongue against and between her teeth and, as a result of the incorrect tongue and lips, resting posture, she exhibited an incorrect swallowing pattern. A referral to the ENT revealed nasal structural obstructions that was “almost completely occluding both nasal airway” so a septoplasty and partial turbinectomy was performed. A referral to the Allergist revealed dramatic Perennial Allergic Rhinitis with seasonal (spring/summer) exacerbation. She was prescribed a saline spray, blow her nose and use Nasonex 2 sprays each nostril daily, supplement with Allegra 10mg once a day and implement pollen and dust avoidance measures. It is stressed in therapy that no one can remain in therapy at this clinic unless they are compliant in following the Allergist’s recommendations because nasal airway issues are the CAUSE of Orofacial Myofunctional Disorders (OMDs) and again, we never want to get so caught up in treating the EFFECT that we ignore the CAUSE. 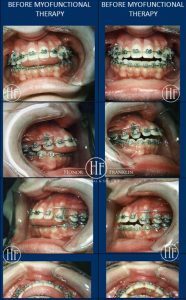 She had orthodontic braces from 14 years old to 16 years old and at age 19, her orthodontist noticed her bite was opening and referred her to me. How could I prove that orofacial myofunctional therapy works? How could I show these patients the improvement they were making? How could I motivate them? Yes, without a doubt, photographs are vital for Orofacial Myofunctional Therapy!!! NOTE: These Photographs were made with a Canon Rebel EOS 60D with a Canon Macro Ring lite (MR-14EX11). Since 1977, Dr. Honor Franklin has specialized in the evaluation and treatment of Orofacial Myofunctional Disorders (OMDs) in children, adolescents and adults which include an incorrect oral rest posture of the tongue and lips, an incorrect swallowing pattern (known as “tongue thrust” or “tongue thrust swallowing”), prolonged non-nutritive sucking habits and articulation (speech) disorders.She holds the distinction of being a Board Certified Orofacial Myologist/Myofunctional Therapist by the International Association of Orofacial Myology (IAOM); an honor held by a small percentage of professionals practicing orofacial myofunctional therapy. In fact, she in the ONLY Certified Orofacial Myofunctional Therapist in Dallas and is only one of three in the state of Texas! In addition, as a practicing Speech-Language Pathologist, she maintains Licensure by the State of Texas and a Certificate of Clinical Competence awarded by the American Speech and Hearing Association (ASHA). Dr. Franklin has had extensive training and experience with orofacial myofunctional disorders (OMDs) and articulation (speech) disorders and is considered an expert in these fields. She welcomes referrals from Orthodontists, Pediatric Dentists, Maxillofacial Surgeons, Dentists, Pediatricians, Internists, and Speech Language Pathologists. How Orofacial Myofunctional Therapy can continue to improve patient’s occlusion 22 years following OMT! It always make my day when patients come back to see me! It’s exciting to see how Orofacial Myofunctional Therapy (OMT) can help a patient’s dental occlusion continue to improve years later after graduating from OMT…in this case, 22 years later!!! This male patient was referred to me by his pediatric dentist, Dr. Mark Kogut of My Kids DDS when he was 15 years old. An Orofacial Myofunctional evaluation revealed an Orofacial Myofunctional Disorder (OMD) characterized by an incorrect oral rest posture of his tongue and lips resulting in a dental openbite and overjet. Since the primary cause of an OMD is nasal airway problems, he was referred to the Allergist and ENT on my team who understand Orofacial Myofunctional Disorders (OMDs). The Allergist’s evaluation revealed Seasonal Allergic Rhinitis and the ENT evaluation revealed a nasal structural obstruction resulting in a tonsillectomy and partial inferior turbinate reduction. Once he healed from the surgeries and once the Allergist taught him how to control his allergies, Orofacial Myofunctional Therapy (OMT) was initiated at this clinic. The first set of photos were taken when he was 15 years old. The second set of photos were taken during OMT. The third set of photos were taken when he was seen 3 years after completing OMT. The fourth set of photos were taken 22 years after OMT. 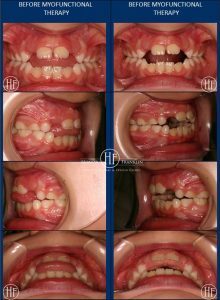 Notice how his dental occlusion has continued to improve with no additional orthodontic treatment. NOTE: OMT does not take the place of orthodontic treatment. You Will Not Believe What This Patient’s Dentist Required Him to Wear Following Orthdontics and Jaw Surgery! I love it when my patients come back to see me! This patient was referred to me in 1989, when he was 34 years old by his maxillofacial surgeon after having undergone orthodontic treatment FIVE times! ( In 1967-1968 and again 1976-1977 in Philadelphia, 1978-1980 in California, 1981-1984 in Dallas, Texas and 1988-1989 in Philadelphia). When he presented to me for an Orofacial Myofunctional Evaluation in 1989 at age 34 years old, he was wearing upper and lower retainers during the day and you will not believe what he was instructed to wear at night to prevent his orthodontic – surgical treatment from relapsing – this horrific “tongue thrust” appliance! !